Matthew Stein is a recent arrival in a small town. Nobody really cares where he came from or even that he’s showed up, except maybe Winifred (Freddie) Zoron, who’s in Matthew’s class and who also happens to belong to the Rebel Rescue Squad. 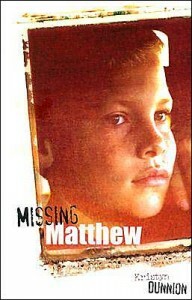 When Matthew doesn’t make it home after school one day, the evening news reports that he’s been kidnapped. What could have happened? Where could he have gone? It takes the initiative of the Rebel Rescue Squad to really get the search underway. Weasel, the squad’s fearless leader as well as Freddie’s best friend, soon discovers that most of the assumptions about the boy’s disappearance are wrong. The rescuers have to deal with a far more challenging mystery than expected—a mystery that lies at the center of the adult relationships in the town. Missing Matthew is by turns hilarious, thoughtful, poignant and ultimately wise about the ways in which kids relate to one another and to the adults in their lives.